Last year, you likely heard about the crocodile charmer in Thailand who nearly lost his life. The man had attempted to perform a dangerous trick by sticking his head inside the animal's mouth but things went horribly wrong. Fortunately, he survived. Unfortunately, however, is that Thailand continues to allow these cruel and dangerous shows, and of course, that means more people will ultimately be hurt or worse. Like the young croc charmer at Phokkathara Zoo who almost lost his arm earlier this week. In a video, that has since gone viral, the man kneels in front of a huge reptile then sticks his arm deep inside its mouth. Seconds later the crocodile bites down and thrashed back and forth while the man - and onlookers screamed in horror. These horrific accidents aren't isolated. In fact, a quick google search turns up several of these deadly or near deadly encounters. And for what, entertainment? Crocodiles are wild animals and they cannot be trained to respect their trainers. Any wrong move could spell the end of a zookeeper, trainer or onlooker alike and yet despite these countless tragic incidents the government of Thailand does nothing to stop these shows. It's time Thailand take steps to ban crocodile shows like these. No one should have to die for our entertainment and all animals deserve to be treated with respect. 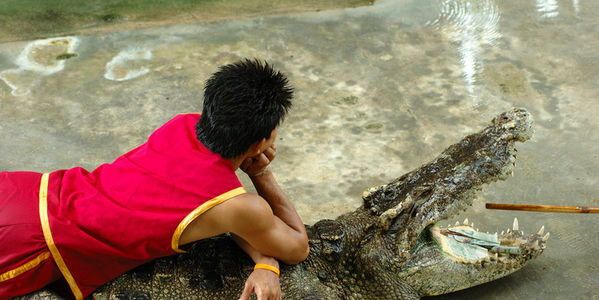 Please sign this petition and ask the Thai Government to ban crocodile shows and help save lives. The dangerous crocodile shows have already maimed many crocodile trainers, all for the entertainment of tourists. These crocodile shows put people's lives needlessly at risk and and are inhumane to the animals. Please ban this practice in your country. Cruelty shouldn't be entertainment.